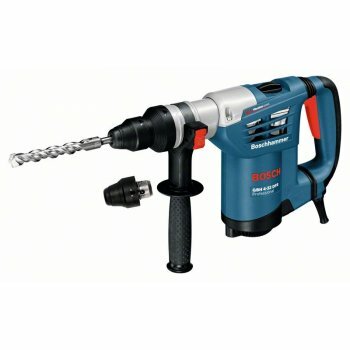 The Bosch GBH 4-32 DFR Multi Drill, Hammer SDS Plus has the fastest multi-hammer in the 4kg class. Offers a wide range of applications in chiselling and drilling work and when working with a core cutter. 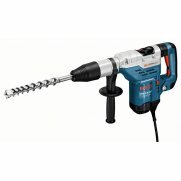 Drills up to 30% faster (25mm diameter) than other tools in its class. 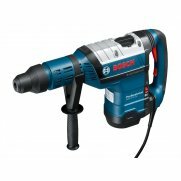 Low vibration levels of only 10 m/s² for less tiring work due to Bosch Vibration Control. Extremely robust due to the aluminium gear housing. 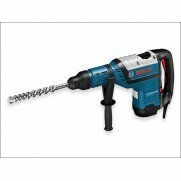 Offers fast changing between SDS-plus and keyless chuck for drilling in wood and metal. It has a compact design for perfect handling. Supplied with an auxiliary handle (2 602 025 176), carrying case (2 605 438 651), depth stop 310mm (1 613 001 003), keyless chuck 13mm (2 608 572 212) and an SDS+ quick-change chuck (2 608 572 213). 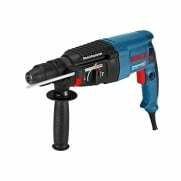 Specification Input Power: 900 Watt.No Load Speed: 0-800/min.Impact Rate: 0-3,600/bpm.Impact Energy: 4.2 Joules.Drilling Capacity: Concrete (Hammer Drill Bits): 6-32mm, Masonry (Core Cutters): 90mm, Steel: 13mm, Wood: 32mm.Optimum Range: Concrete (Hammer Drill Bits): 14-25mm.Weight: 4.7kg. Noise/Vibration Information Measured values determined according to EN 60745. Total vibration values (vector sum of three directions). Chiselling Vibration Emission Value ah: 9.0 m/s².Uncertainty K: 1.5 m/s². Hammer Drilling in Concrete Vibration Emission Value ah: 10.0 m/s².Uncertainty K: 1.5 m/s².